Building a privacy fence can make your yard an oasis, offering respite from prying eyes and barking dogs, and allowing you to create your own private, unique atmosphere. There are many options for privacy fencing, from pre-built wood or vinyl panels to do-it-yourself constructions that allow you to add a unique character to your yard or patio. The key to a good fence is to start with a plan. Plan the project well, and know exactly what you need before you begin. An important step in planning your fence installation is choosing the right fence material. Make sure to take into account your particular climate when selecting materials for your privacy fence. In moderate climates vinyl is an excellent alternative for a fence to wood or aluminum. 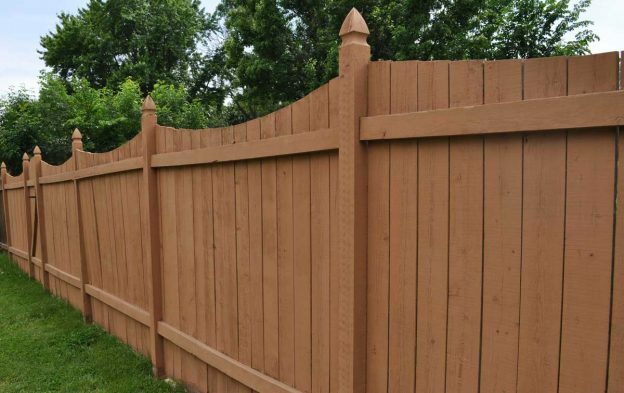 Although vinyl fencing is easy to install, does not rot from contact with wet ground, requires almost no maintenance, never needs painting, and can last decades, it can discolor in hot climates, almost like a sunburn, with brown or blackening sections where the sun beats down on the material every day. Also, vinyl or PVC materials can weaken and crack after years in hot sun. Pre-measure (twice! ), and have all your cuts made at the lumber yard. This service is often free, and if not, really affordable (like 50 cents a cut). You can use a fence calculator to find how many boards you will need. Stack up 4 to 6 board per cut for maximum efficiency, and get all your angle and straight cuts done perfectly by a pro on an industrial-grade saw so you don’t have to worry about needing help, slipping lumber, or bad blades burning the wood or cracking, splitting or chipping big chunks out of it. Having your cuts made at the lumber yard or home improvement center is also insurance against getting a “bad” board that may split or crack. If this occurs during cutting, they replace it, and you know all your lumber is sound. This method insures you only pay for quality lumber that you know is cut straight and isn’t going to crack, split, or be terribly warped when you get it home. For the more experienced DIYer, block walls afford the ultimate in privacy and sound reduction. They need minimal upkeep, can be painted or coated with stucco as desired, and provide more formidable separation between your yard and your neighbors’. Dig a hole at least 2 feet deep and twice as wide as your post. Use a level on all four side of each post to make sure it is perfectly straight before adding concrete to the hole. Use concrete to set the posts in place or consider a foam alternative, and be sure to let the cement or foam fixative set the required amount of time before attaching the fencing panels or lumber. Temporarily attach a 2X4 prop to keep the post plumb until it the cement dries. When using lumber – either pre-built 8-foot panels or individual boards – leave a few inches of space at the bottom to prevent the wood from rotting due to contact with the ground. This space can be filled with specially treated lumber, bricks, concrete, or left open to allow air to pass through. Another trick is to use angle, rather than straight, cuts on your cap boards, to strengthen the joints and help the lumber resist warping as it ages. Plan to repaint or reseal wood fences at least every three years to prevent moisture or sun damage and extend the life of the lumber. When attaching fence boards or panels nails are good, but screws are better, and it’s always a good idea to pre-drill the holes to prevent the lumber from cracking or splitting during attachment. Also, don’t worry about making the tops of the posts even, just measure with a string line and cut them all to the same height after the fence is complete. Then you can add top caps, solar lights, plant hangers, garden gnomes, anything you want to make your yard unique. Make sure you have a good plan for your fence design before you start so you know how all of the fence pieces will fit together. Our wood privacy fence installation guide can help. If you already have a fence but want to add privacy, there are many view-obscuring options available. Adding vinyl slats to chain-link fencing can take the fence from see-through to view-obscuring, and many colors are available to allow for unique patterns, designs, even art. Solar screen materials can be attached with zip-ties to wrought-iron fence sections; adding pre-built lattice sections to patios or fences can add privacy and a clean look. Paintable wood and vinyl options exist, as well as a variety of vinyl colors that never need repainting. Lattice sections added to the top of wooden fences can add height and let in light while partially obscuring the view. Estimate materials and pricing for a vinyl fence, including how many posts and panels are needed.